Science 7 is a skills-oriented course for doing and thinking. 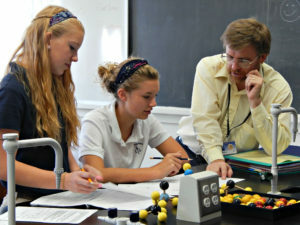 A science course for 7th-grade students that relates life science to everyday life. The major kingdoms of living things are taught, as well as some human biology. The course emphasizes God as the creator of all life. Appropriate laboratory exercises are included. Physical Science is an introduction to Physics and Chemistry giving 8th-grade students a bi-weekly laboratory experience. Topics covered include the scientific method, the laws of motion, measurement and metrics, mechanical and heat energy, nature of matter, classification of matter, chemical reactions, atomic structure and the periodic table, waves, light, and sound. Classroom demonstrations are presented by the teacher, and each student has an opportunity to conduct a demonstration for the class. The four main topics covered in Earth Science include Geology, Meteorology, Oceanography, and Astronomy. Students are exposed to evolutionary and creationist models of geologic history. There is a weekly double period for laboratory and students are expected to complete a minimum of 30 labs for the course. Biology covers topics that are basic to all biological studies and covers philosophy and theory of many of the areas of biological discoveries that most affect our lives. There is a survey of the major groups of living things on our planet done in a traditional “classification” approach to studying organisms. Also included are units on human anatomy, physiology, and genetics. Appropriate laboratory exercises are included. This course of study presents a modern view of chemistry suitable for students with a wide range of skills and abilities. The major units include atomic theory, the periodic table, reactions and equations, stoichiometry, solutions, acids and bases, thermodynamics, kinetics and equilibrium, oxidation-reduction, and organic chemistry. The topics provide the unifying principles of chemistry. The principles included are basic to the understanding of how the world works. Weekly laboratory activities encourage scientific thinking and demonstrate concepts studied. This course presents a modern view of physics with emphasis placed on the fundamental concepts underlying the science. Encourages the utilization of concepts such as conservation of energy, vectors and scalars, and fields as unifying themes rather than isolated topics. The major units of study include: mechanics, work and energy, waves and light, and electricity and magnetism. This approach fosters an appreciation for the unity of physics. Weekly laboratory activities encourage scientific thinking and demonstrate concepts studied. AP Biology is an introductory college-level biology course. Students cultivate their understanding of biology through inquiry-based investigations as they explore the following topics: evolution, cellular processes—energy and communication, genetics, information transfer, ecology, and interactions. The last month will be dedicated to examining the problems of Darwinian evolution in terms of the origin of life from a Biblical world view. Global Environment is a 3-credit college-level environmental science course taught through the SUNY College of Environmental Science and Forestry (ESF). The course examines principles of ecology and balanced ecosystems before delving into topics related to man’s disruption of those ecosystems, and his responsibility as steward of the earth. Topics include world population growth, agriculture, pollution, water resources, biodiversity, global climate change, and renewable energy resources. Successful completion of high school biology and enrollment in high school chemistry are prerequisites to the course. The class meets every day for one semester or 2-3 times a week for the entire school year.